Doshu's first visiting to Kuching in August 1972. Doshu made a speech to the huge support of spectators. 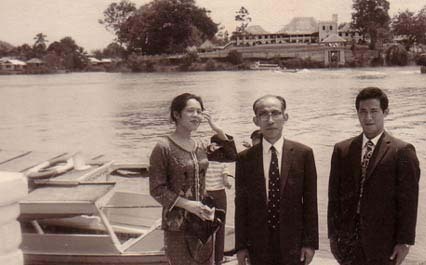 L to R, Madam Kimiko, Kisshomaru Doshu and Mr. Endo proceeded to the Istana to make a courtesy call on the governor, which was a minute's across the S'wak river by the small boat called Sampan. Madam Kimiko came back to the mat even during nursing of the children. 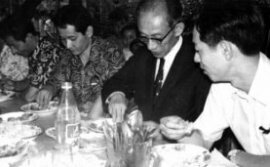 Doshu attending Malay tradisional wedding as a guest of honor, it was his first experience using his hand to eat, in 1972. Yamada Shihan and Madam Kimiko's first return to the capital, Tokyo, were warmly welcomed by (L to R) Osawa Kisaburo Sensei, the Shihan, and Mrs. Kimiko, Kisshomaru 2nd Doshu and of Doshu's adviser Miyazaki Yoshimasa Sensei. Academy Aikido Jyuku visited by Singapore Aikikai together with Moriteru Dojo-cho(now 3rd Doshu), in February 1989. 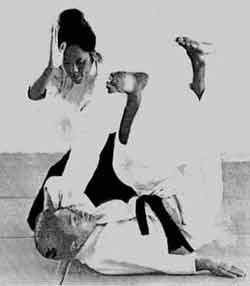 Academy Aikido Jyuku is now 29 years old. It's age can been seen from the evidences of the Yamada's lives in Malaysia. Photo taken on New Year's day of 1972. Ms Kimiko came to Malaysia same year.